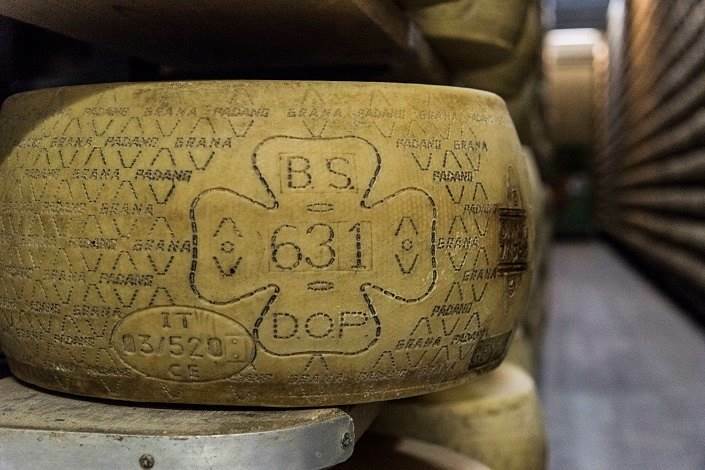 When we arrive in Orzinuovi, at the Ferretti cheese factory, Cinzia greets us exclaiming: “Stanno cavando” thus announcing the moment when the twin wheels are extracted from the copper cauldrons. 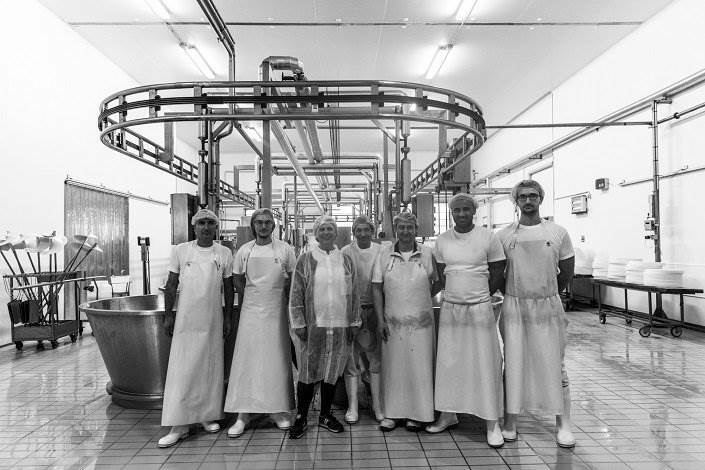 At work there is a young man and a close-knit group of men aided by a semi-automated processing system which allows them to follow the milk’s transformation without the exertion of manual labour. 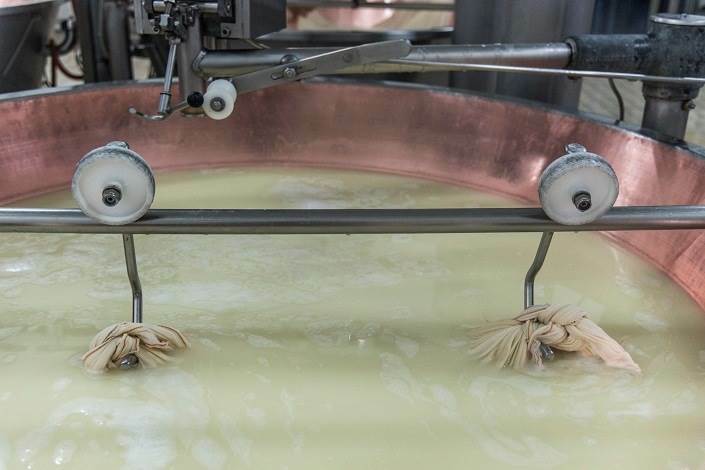 The twins, however, do not become separated on their own, and we can see them undertaking the brotherly act of pulling the strips of linen cloth out of the milk. 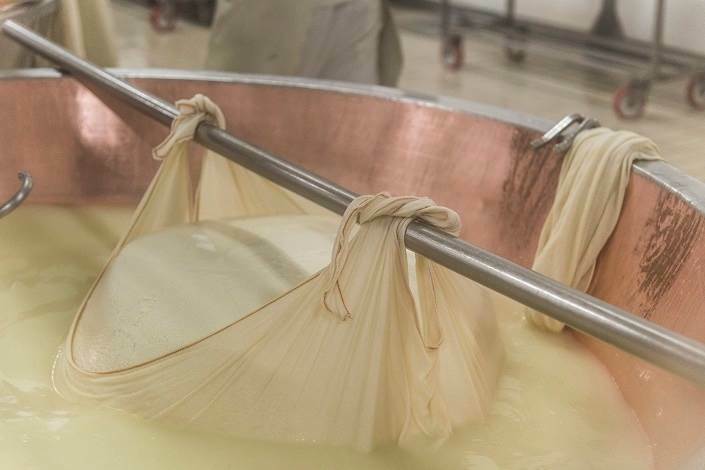 In a process as beautiful as it is delicate, the cheese mass is pulled out to be then divided into 2 equal parts, which gives rise to the “twin wheels”. Madame Cinzia has established a lovely relationship with her employees. 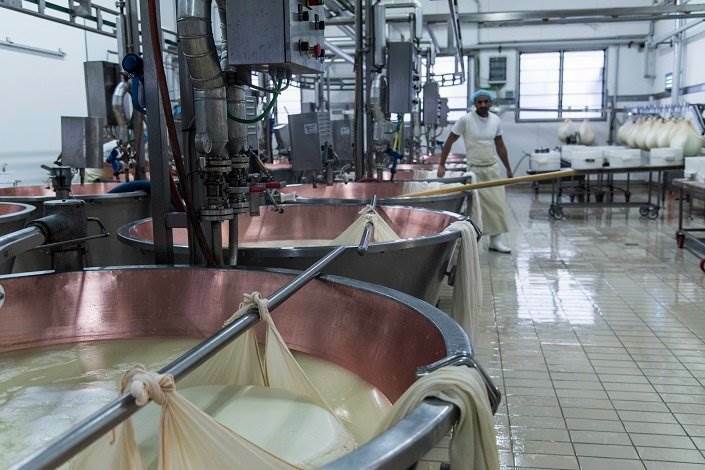 The sole care for order and cleanliness that she has be able to transfer to her co-workers is immediately noticeable, along with the benefits for the milk transformation process. The work environment is therefore visibly calm, serene and orderly, and Cinzia and the guys continually exchange very meaningful looks of understanding and gratitude. 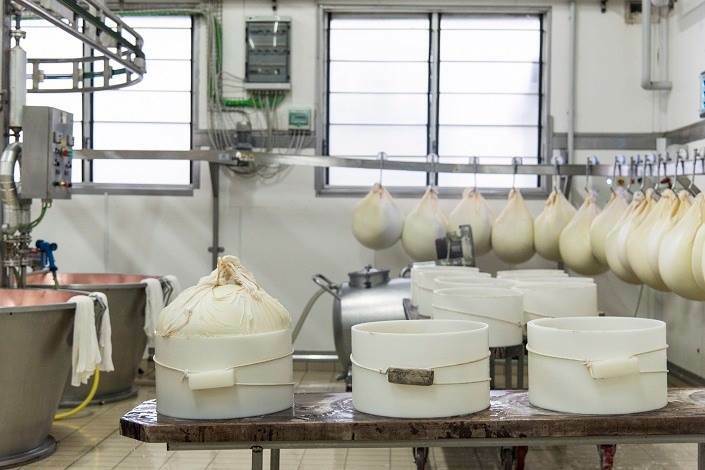 Cinzia is moved when she tells us about her cheese factory, inherited from her father who loved this work so much and who, in the past, just to make cheese, had created a small processing room at home. 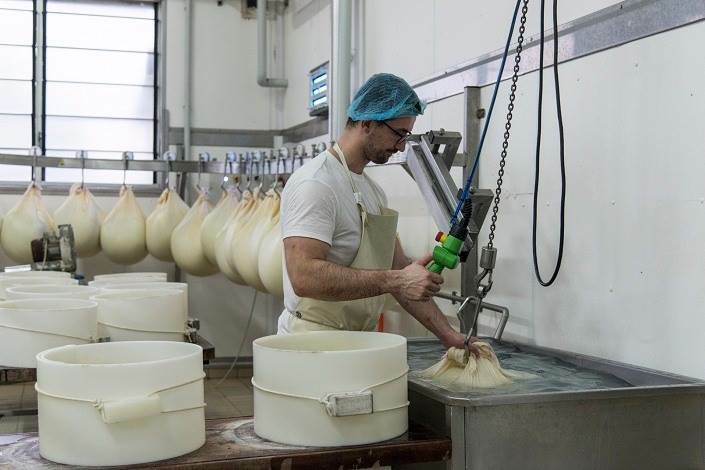 He was the expert; just looking at the milk he understood if it was good for his cheese and then with experience and knowledge, he turned it into wheels of perfect cheese with an unmistakable aroma. After Cinzia’s father, Mr Ferretti, withdrew from work, she felt duty-bound to continue his business, and with a great deal of effort and dedication she looked beyond. 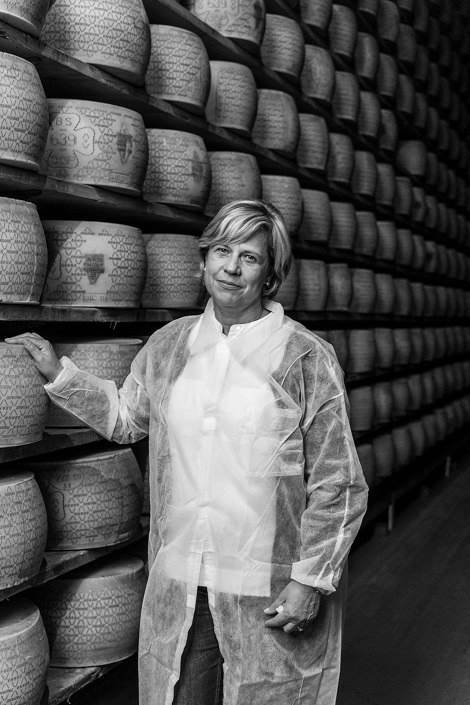 In speaking about this, she feels the need to stress that feeling of mutual respect and support that exists with other Grana Padano manufacturers. Right from the start they did not leave her alone, rather they gave her constant support in her pursuit of high levels of quality. 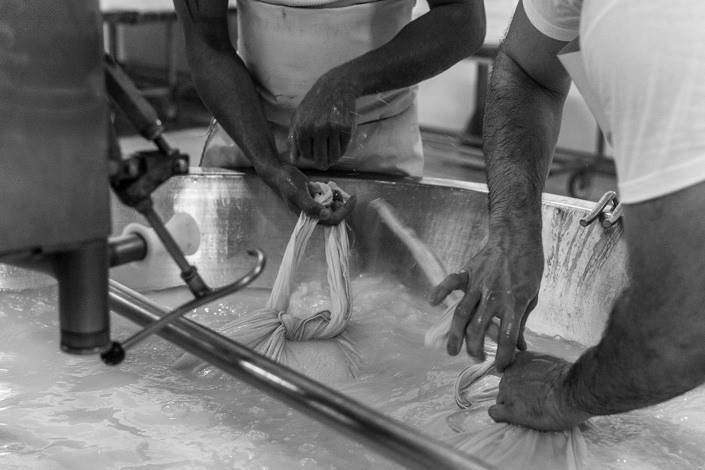 With the advice and friendship of other manufacturers, Cinzia continues with her business, looking towards the future and to ongoing renewal, both in terms of aesthetics and function. The next work she is undertaking relates to installing solar panels to fuel the factory, also contributing to the sustainability of the manufacturing process. However, she does not forget the teachings of her father who is no longer with her but continues to give her strength to move forward.